The Hampton Inn ATL-Lawrenceville-I-85-Sugarloaf GA hotel is located northeast of downtown Atlanta Georgia in Gwinnett County at I-85 and Sugarloaf Parkway. This Hampton Inn hotel is conveniently located within walking distance to Discover Mills and just minutes from the Gwinnett Arena and Convention Center. The Hampton Inn Lawrenceville hotel is also convenient to many businesses and office parks including Huntcrest Office Park Cisco IKON Office Solutions Safeco Insurance and Chemtura. 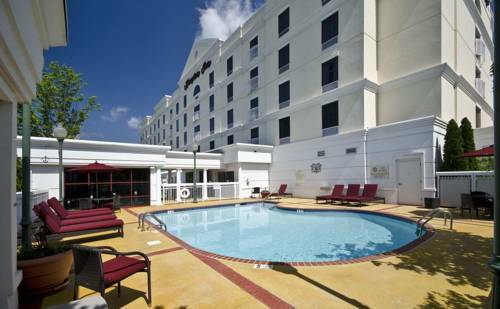 The Hampton Inn ATL-Lawrenceville/Sugarloaf hotel features 127 guest rooms meeting room space exercise facility and outdoor pool. Each Hampton Inn hotel room features a work desk complimentary wired and wireless high-speed Internet access speakerphone microwave mini-fridge coffee maker hair dryer and an iron and ironing board. Complimentary breakfast is served each morning from 6-10am. The Hampton Inn Lawrenceville/Sugarloaf has wireless high-speed internet access provided throughout our entire lobby area and the guestrooms are both wired and wireless. We love having you here at the Hampton Inn ATL-Lawrenceville-I-85-Sugarloaf GA in Georgia.